Louis-Léopold Boilly, The Poor Cat (detail), 1832. Oil on canvas, 31.9 × 40.4 cm. The Ramsbury Manor Foundation. Photo © courtesy the Trustees. Straddling two ages, Boilly’s paintings mirror the ever-changing world of Paris over sixty years, from the ancien régime soon to be swept away by the Revolution, to the rise and fall of Napoleon and then the restoration and final overthrow of the Bourbon Monarchy. This modest exhibition drawn from a single collection, The Ramsbury Foundation, provides a rare opportunity to see together a range of his artistic achievements. Louis Léopold Boilly was born near Lille in 1761, the son of a wood sculptor. Trained by his father, he was precocious and soon set up as an independent painter of portraits and genre subjects first in Douai and then Arras. He arrived in Paris in 1785 and specialised in producing the charming small genre scenes of a mildly risqué nature which were so popular in 18th-century Paris. He excelled in the depiction of luxurious textiles and fashionable accessories as displayed by the two young ladies in Comparing Little Feet (c. 1791), where they are busily removing their shoes and stockings in a most suggestive manner. One lifts her dress of green silk to uncover her leg, while the other is dressed in an all-revealing white gown with a pink ribbon, from which is exposed her naked knee. Both their garments, as well as the objects displayed on the table beside them, are exquisitely painted. In his picture Grateful Hearts (c. 1790), one’s eye is immediately drawn to the brightly lit white satin cape, edged in fur and worn over the yellow and blue silk dress of the wealthy woman, and to her extravagant hat trimmed with vast pink bows emulating Louise-Marie-Adélaide de Bourbon, Duchess of Orléans. The treatment recalls the Dutch 17th-century genre paintings by Metsu and Ter Borch which were so highly prized by contemporary Parisian collectors. However, Two Young Women Kissing (1790-4), provides something of a surprise when he depicts two young women locked in an amorous embrace. The taller of the two, somewhat déshabillé, wears a white dress which has slipped from her shoulder revealing her breast. This blatantly sexual scene was of the type that led him to be called before the tribunal of the Société Populaire et Républicaine des Arts, who accused him of painting pictures “of revolting obscenity to republican morals, the obscenity of which dirties the walls of the republic”. Citing in his defence the unquestionable orthodoxy of his painting the Triumph of Marat (not in the exhibition), Boilly was able to prove to their satisfaction his allegiance to the new Republic and was cleared of all suspicion. The Salon, which had previously displayed paintings – notably history paintings – only by artists trained in the Académie Royale de Peinture et de Sculpture in accordance with its strictly enforced rules, was after the Revolution opened in 1791 to all comers, thereby providing new opportunities for a wider range of artists, including Boilly. With the loss of his aristocratic patrons he turned to portraiture and exhibited, in the Salon of 1798, The Meeting of Artists in Isabey’s Studio (1798, Louvre, Paris) with great success. In this ostensibly informal group portrait, thirty-one contemporary artists, sculptors, engravers, architects, actors and writers are shown in Jean-Baptiste Isabey’s studio seen against a background decorated in the fashionable Etruscan taste after drawings provided by the architects Charles Percier and Pierre François Fontaine, both of whom appear in the painting. Isabey stands out by virtue of his red jacket, gazing at an easel in front of which is seated the history painter François Gerard. Arranged in groups, the individuals look at each other or stare out of the picture at us, including Boilly himself, instantly recognisable from his later Sheet of Studies with Five Self-Portrait Drawings of the Artist (c. 1810). These powerful black chalk drawings portray him wearing his spectacles, his features scrutinized from different angles. Exhibited beside the painting is a study for The Meeting of Artists in Isabey’s Studio, freely drawn in black chalk and stump with white heightening, which shows the group around Isabey himself and includes a young girl who is omitted from the finished painting. For the painting, Boilly executed individual oil studies and precisely painted portraits of all included (27 in Lille). The clear identification of each figure contributed to the picture’s great popularity among the public, although for reasons unknown the leading painter of the Revolution, Jacques-Louis David, was not included. By providing a who’s who of the Parisian art world, Boilly was promoting both himself and his peers. The portrait of Madame Louis-Julien Gohin, her Son and her Stepdaughters (c. 1800-2) belongs to the new era. Madame Gohin, with a pensive expression and seated in front of a screen, wears a white empire-style gown, her elbow resting on a table covered with a red plush while she holds a locket. Her son, clutching his violin, leans on her lap, his discarded toys scattered on the floor, while a small open box on the footstool contains a beetle. The two girls on the other side of the table are reading and writing and one looks up at an insect on the screen. Painted with great refinement and delicacy, the colours are restrained and the mood is serious with the emphasis on childhood learning. Portraiture was a profitable constant throughout Boilly’s life and he is reputed to have painted thousands of portraits. Due to his speed of execution and boast of only needing two-hour sittings, he attracted a great variety of patrons and with his affordable modest prices established a flourishing market for them. In Portrait of the Comtesse François de Sainte-Aldegone (c. 1800-10), she is painted simply, dressed as a young girl against a greyish background. Her heart-shaped face is framed by her fashionably dressed dark hair, and her large eyes gazing out at us are typical of his portraits. In these very small portraits, painted with his acute observation, Boilly is able to capture his sitter’s character, not least in the Portrait of a Lawyer with, rather unusually for a lawyer, smiling features. Under the heading From Boudoir to Boulevard, the exhibition and catalogue explore the next stage in Boilly’s career. Outdoor scenes of Parisian life and its entertainments became a major source of subject matter which he exploited in different media. Twice-married and shouldering the obligations of maintaining a large number of children, in the 1820s he turned to print making to augment his income. Boilly produced in about 1825 the drawing Poor Cat exhibited here, which is in preparation for a lithograph. A crowd is gathered in front of a hand puppet theatre where a moustachioed harlequin attempts to make a cat jump through a hoop. Seven years later Boilly re-used this composition as the basis for his small, meticulously executed oil painting of the same subject. In a dark leafy setting the close group of spectators are lit by a brilliant shaft of light which shines on a woman seen from behind. She wears an exquisite, lilac-coloured dress with large, puffed-out sleeves and a pale blue silken shawl around her shoulders, topped by a large white brimmed hat trimmed with lilac-coloured ostrich feathers. The light plays over the costumes of her three children and the well-dressed man sporting a dark mauve top hat. Boilly updated the style of her dress from the drawing of 1825 and made a number of significant changes to the composition by adding a black and white cabriolet to the background and two brightly lit soldiers. The changes draw attention to the prosperous middle-class status of the family in contrast to the poor woman and her children seated in the shadows. The boy beside the group in the drawing has now become a pickpocket. The characters are minutely observed and some of the children and the woman with the plate, who has now aged, stare out at one. Throughout his life Boilly was concerned with looking, and in his ability to play tricks on the viewer, he proved himself a superlative master of illusionism. A Girl at a Window (c. 1799, National Gallery, London) is painted in black, white and grey with minute paint strokes and extremely smooth finish to give an illusion of a print with a blue mount which he has signed in paint. It represents a girl in a white dress seated on a stone ledge supported by a sculpted relief against the dark interior. She holds a lorgnette and looks at us over her shoulder surrounded by a variety of objects precisely painted. In the shadows is a boy with a telescope on a stand, and behind her, two fish swim in a glass bowl above which hangs a bird in a cage. The composition recalls the pictures of the 17th-century Dutch fijnschilders (‘fine painters’) such as Gerrit Dou (1613-76), and it stresses Boilly’s deep fascination with optics and perception. In A Young Girl Holding Her Dog (1797-8), he draws the girl seated in a humble attic interior, with small spaniel on her lap, who turns to catch our eye. She is lit by a shaft of light coming from the sloping window in the roof which lights up a variety of domestic objects. The subject is a drawing in black and white chalk and stump, but it tricks the eye by imitating an engraving. The lines on her dress and other details such veins on her hand imitate the lines of the engraver’s burin. The most convincing of all his illusionistic paintings is A Trompe-L’oeil Crucifix of Ivory and Wood (1812, loaned by Jean-Luc Baroni, London), painted on canvas. We are taken in by the incredibly realistic figure of Christ, sculpted in ivory on a simple wooden cross, painted against a plain grey background only broken by the shadows it casts. Yet in jest Boilly has painted a cartellino (a small inscribed piece of paper) on the left side with his name and address on it as if to advertise himself! The most complex of all his paintings is his late masterpiece A Carnival Scene (1832), in which the large animated crowd is arranged across the wide open space backed by the Théâtre de la Porte-Saint-Martin. The scene, populated by characters conjured up from his long career, is technically brilliant. Many are by implication in fancy dress with the couple in the centre conspicuous by virtue of their luxurious pre-Revolutionary clothes. A man with a monkey mask dances in the foreground and actors from the Commedia dell’Arte are grouped on the left, while on the right there are groups of colourful, well-dressed contemporary families with their children. More puzzling is the dog in the foreground with a theatrical mask fixed around its tail only to be echoed by the man dressed in women’s clothes of revolutionary colours climbing onto a carriage behind the crowd, lifting his skirts to reveal his backside. This is ostensibly a genre scene writ large though with a slightly sinister twist. But altogether this revealing exhibition demonstrates how Boilly moved from the 18th century into another world of the realism of the 19th century. 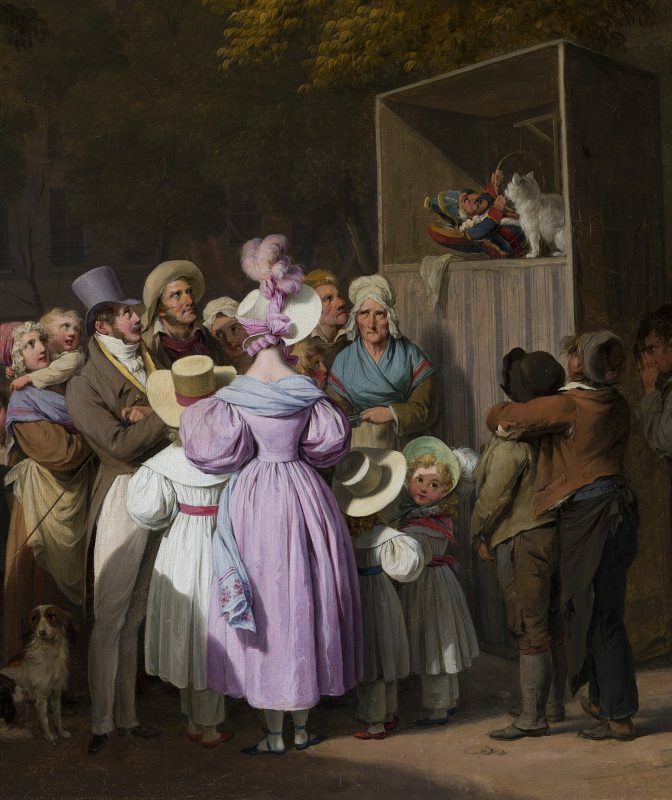 Boilly: Scenes of Parisian Life is at The National Gallery, London, from 28 February to 19 May 2019. The catalogue, by Francesca Whitlum-Cooper, is available for £16.95. Three further paintings by Boilly are the subject of a special display at The Wallace Collection, London, to accompany the National Gallery exhibition.